Saint Euphrosyne was born between 1101 and 1104 and named Predslava in the world. She was the daughter of Prince George Vseslavich, second son of Vseslav the Sorcerer, of the Rurik noble family, members of which were the dukes of the principality of Polotsk, in what is modern day Belarus. From her childhood she was noted for her love of prayer and book learning. She refused all proposals of marriage and, without her parents' knowledge, ran away to the convent at the age of twelve where her aunt was the abbess. She first critically reacted to the decision of the girl and, fearing her father's anger, discouraged her niece. However, after the requests of Predislava, she blessed her. The father did not approve of the choice of his daughter, and her whole family was grieved. Predslava received monastic tonsure with the name Euphrosyne. With the blessing of Bishop Elias of Polotsk, she began to live in the basement of the Sophia Cathedral, where she occupied herself by the copying of books. The money she thus earned she distributed amongst the poor. The process of copying books was extremely difficult and slow, it was hard physical work, and it was exclusively for men. The scribe did not write on a table, but on the palm of his left hand, with his elbow resting on his knee. He wrote on the parchment according to the rule - large and straight, without a slope, each letter was separated from the next one. The scribe should not only have a good knowledge of grammar, but also have artistic abilities, since the initial letters and headings of sections had to be decorated with animal or vegetable patterns. In addition, books were often decorated with specially written capital letters. During the day, it was possible to write off no more than four pages. One day an angel took Euphrosyne in a dream and brought her to Seltso, two miles from Polotsk, on the bank of the Polota, and said: "Here you must be!" The dream was repeated three times. Around the year 1128 Bishop Elias entrusted the nun with the task of organizing a women’s monastery. Setting out for Seltso, the site of the future monastery, the ascetic took only her holy books. 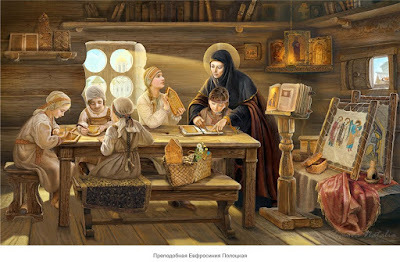 At the newly constructed Savior-Transfiguration Monastery the Saint taught the girls to copy books, singing, sewing and other handicrafts. Construction was completed in 1133. Through her efforts, the Church of the Holy Savior was built in 1161, which still stands today and is considered to be the most precious monument of early Belarusian architecture. Saint Euphrosyne also founded a men’s monastery dedicated to the Mother of God. Patriarch Luke of Constantinople sent a copy of the wonderworking Ephesus Icon of the Mother of God, also known as the Korsun Icon, at her request. 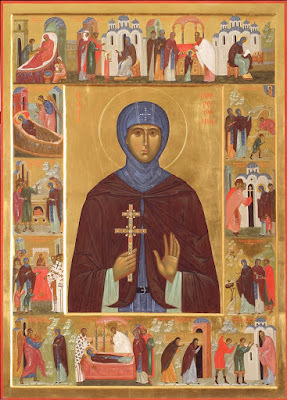 Shortly before her death, Saint Euphrosyne journeyed on pilgrimage to Constantinople and the Holy Land with her nephew David and sister Eupraxia. Grave of St. Euphrosyne at Saint Theodosios Monastery. Photo taken in the 1930s. On the way to Constantinople in 1167 she met Emperor Manuel, who at that time was going to war with the Hungarians. After venerating the holy places in Constantinople, she departed for Jerusalem. The Crusader king, Amalric I of Jerusalem, received her in the Holy Land. 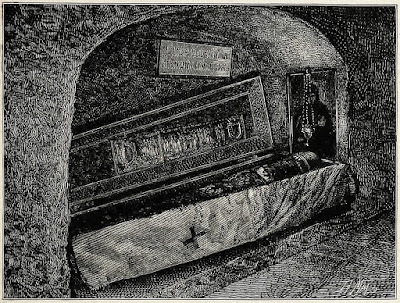 In Jerusalem, Euphrosyne went to the Holy Sepulcher. A few days later, she fell ill and sent her nephew and sister for holy water to the Jordan. After the appearance of an angel, Euphrosyne began preparing for her death. 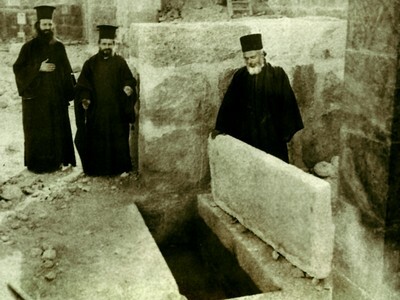 She sent a petition to be buried at the Lavra of Saint Savvas, but her request was denied due to it being a monastery for men only where women were forbidden. 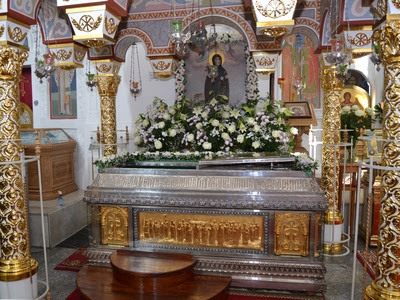 Having received the refusal, she sent a servant to buy a coffin and arrange for her to be buried at the Russian Monastery of the Most Holy Theotokos, which was at the Monastery of Saint Theodosios the Great. The Lord granted her a peaceful end after 23 days of illness on May 24, 1167. 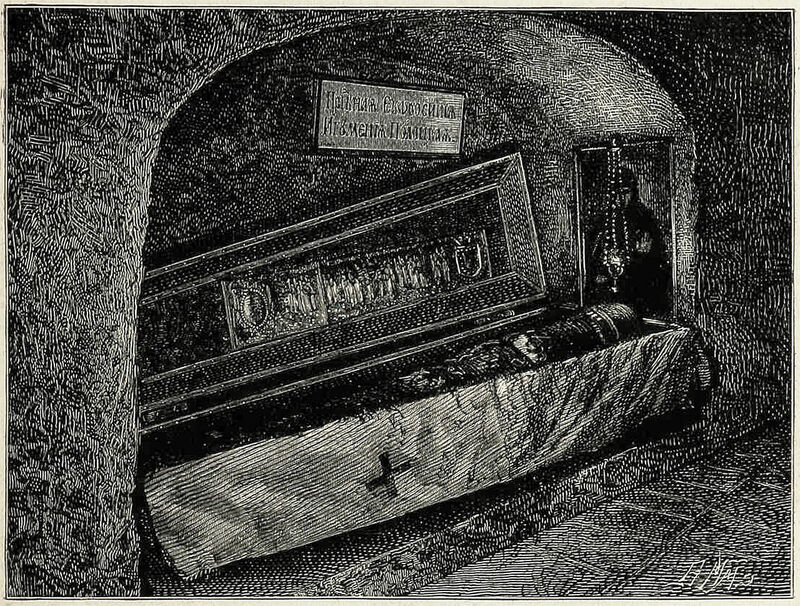 Her body, after the conquest of Jerusalem by Saladin in 1187, was carried by the monks to Kiev and deposited there in the Kiev Caves Monastery, and the relics were transferred to Polotsk in 1910 to the monastery she founded. Transfer of the Relics of St. Euphrosyne to Polotsk in 1910. 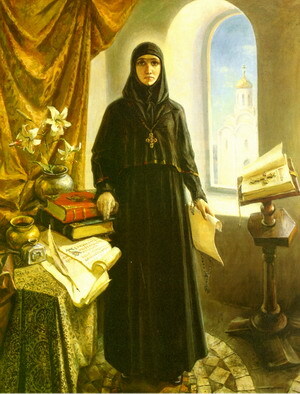 Saint Euphrosyne of Polotsk was glorified in the Russian Church as a patroness of women’s monasticism. 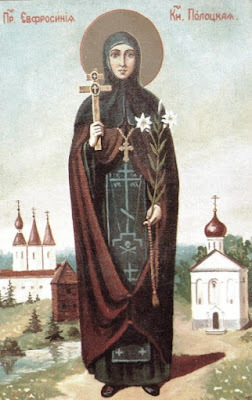 She is the only virgin saint of East Slav origin. 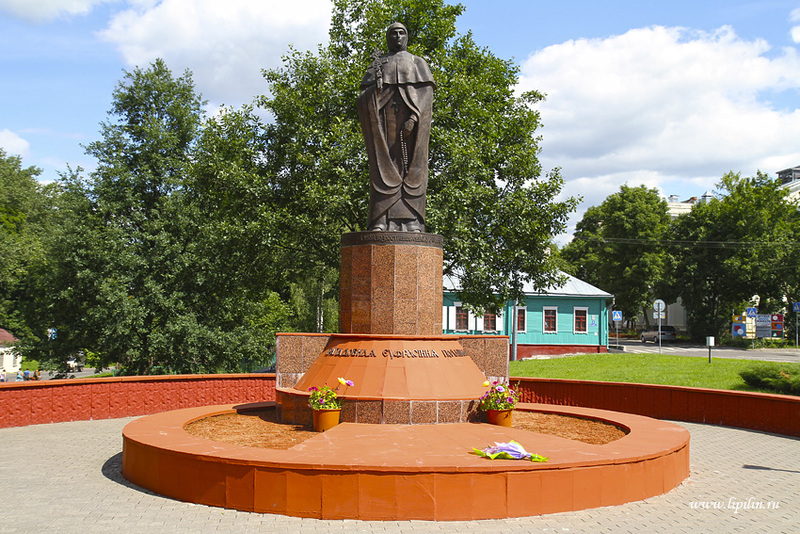 Euphrosyne (or Efrosinia) of Polotsk is a patron saint of Belarus. In Belarus there is a Convent of Saint Euphrosyne in Polotsk and a Saint Euphrosyne Orthodox Church in Minsk. 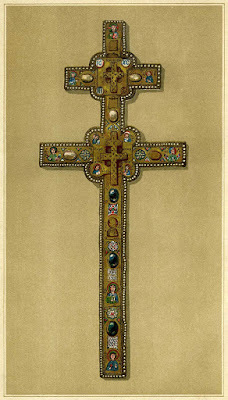 Cross of St. Euphrosyne. Lithograph from 1889. The Cross of Saint Euphrosyne was a splendid gem-studded cross created at her behest by a local master, Lazar Bohsa. The famous six-armed golden cross was decorated with enamels and precious stones and presented by her to the church of the Holy Saviour in 1161. Of exquisite beauty, the relic survived centuries of turbulence until World War II, when it mysteriously disappeared during the evacuation of the museum in 1941. For the last time, the cross was seen in Mogilev. Despite some efforts of the Belarusian government to trace in the early 1990s the whereabouts of this treasure, which included even searching in private collections in the United States, nothing has been found.